I travel to Orlando to see a former Boulder CO landlord who is visiting a mutual friend with a time-share condo just east of Disneyworld. I promise, in my brief time with her, that I would give her a taste of hiking-Florida-style (she lives in a community within the shadow of the foothills of the Colorado Rockies, which means that a hike in flatlands Florida will be quite a change of pace to what she is used to). In planning the trip in advance, she asks the common questions I've learned to expect from non-Floridians: "Should I fear attacks by alligators and snakes during the hike?" I reassure her that there is no reason to be concerned. For our first night of dining, I select the very walkable Winter Park. We head for the romantic, walkable Park Avenue, and are fortunate to serendipitously discover a place called "310 Park South." Turns out to be delicious. I order a grouper filet, which is quite good. 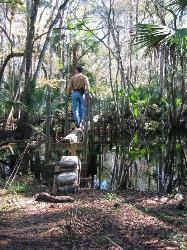 I am fortunate as I have just acquired a hiking guide for a good many trails in Florida. 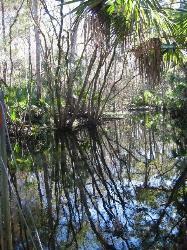 I select 10-15 trails in the Orlando region. I select two areas that are approximately 25 miles southeast of Orlando and The Mouse. So we set out, heading east on Route 192 toward the town of St Cloud. 192 is an agonizing stereotype of strip commercial misery and outlandish, cartoonish kitsch architeture. I feel as if I have somehow taken a wrong turn and ended up on the Las Vegas strip instead of central Florida. Our first destination is Bull Creek Wildlife Management Area. I vow that we will firmly, resolutely refuse to subject ourselves to a touristy, franchise fast-food joint for breakfast. No "Waffle House" or "Egg McMuffin" or "IHOP" for us. My decision, instead, is to get off of 192 and head into "downtown, historic St Cloud." Appallingly, we pass by a sign indicating a small, shoebox-like building is the St Cloud city hall. I point out to my friend that this city hall building is, BY FAR, the most embarrassing, pathetic city hall building I have EVER seen. (It later turns out to be a temporary venue for city administration, mercifully.) Impressively, as we drive toward the heart of town, we notice that a new city hall building is being erected. In part, it is impressive because it very appropriately terminates the street vista, which conveys the proper civic design message that "this is an important community building" (instead of being in an out-of-sight, throwaway location we so often toss our public buildings into these days). Unimpressively, the community has blundered by opting for a very modernistic, forgettable design. So they got it half right. Superb location. Miserable architecture. We pull into the very admirable on-street parking St Cloud still retains (and notice that, sadly and blunderously, the community has paved over its fabulous, historic brick street). Very quickly, we spot what appears to be an authentic breakfast diner. Sure enough, "Nannie's Breakfast Diner" has it all. Very campy interior design. Full of loud-talking, laughing locals. Menu full of affordable, home-style food. Satisfied, we head back out onto the torture of 192. Soon, though, we find the entrance to Bull Creek, which leads us down Crabgrass road-a washboard-bumpy, sandy road. We stop at a ranger station for advice. The 23,485-acre Bull Creek WMA, located in Osceola County, once had a tram system used to haul cypress out of the wetland area when logging occurred in the distant past. The trail follows this old tram road. In addition to cypress, turpentine and pitch were also harvested here. The trail turns out to be well-marked with frequent orange blazes once we get onto the Florida Trail. 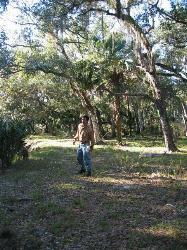 We pass through classic Florida landscapes of sandy soils, pine flatwood and oak forests, and lots of cabbage palm. We discover that much of the ground has been ravaged by hordes of wild pigs who have so aggressively churned up the soil that the ground appears wave-like. We arrive at the 192 bridge we were told about, but then lose the trail route. After about 40 minutes of searching, we give up and resign ourselves to doubling back on the trail we came in on. It turns out that while the trail is well-marked, trail junctions are NOT well-marked. So we missed the junction we needed to find to complete our loop hike. But we were extremely fortunate to miss our turn, as our return along the same trail gave us another chance to cross a very attractive "3 Bridges" section of the trail, where 3 single-file plank wood and cable suspension bridges cross blackwater creeks (see photo below left). While our first crossing at 3 Bridges was uneventful, our SECOND crossing was stupendous! Upon reaching the first bridge, I am greeted by loud splashing in the water. Quickly mounting the bridge, I am stunned. We are met by FIVE river otters, who are very loudly squawking at us (we had apparently walked too closely to their home). Never in my life had I seen more than one of these cute little critters before. But here we are, witnessing five otters SIMULTANEOUSLY, and only about 10 feet from us with their impatient, angry heads jutting out of the water as they hiss at us in warning. Upon returning to the ranger station, we call on the rangers for more advice. "Where can we find a good restaurant for lunch?" Their advice turns out to be quite good. We are directed to the Lake Marion Restaurant along the way to our second trail destination. Once again, authentic, campy décor and Florida natives staffing the place. I opt for a more than adequate fish sandwich and a side of swamp cabbage-the cabbage being highly recommended by the rangers, particularly for non-Floridians looking for a "Florida" experience. 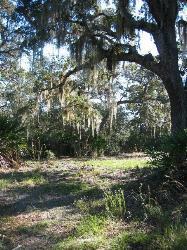 Our second hike is the Three Lakes Wildlife Management Area near Lake Jackson and Lake Marion. This 52,976-acre WMA is partially within the Prairie Lakes State Preserve, and contains one of the longest wooded hikes in Central Florida. The rangers have strongly recommended that we opt for the "south loop trail." But once again, the trail junction signage foils us, as we discover at the end of our hike that we had instead hiked the "north loop." Again, fortunately, the orange blazes along the Florida Trail are frequent and visible. Along the way, we spot deer and turkey. 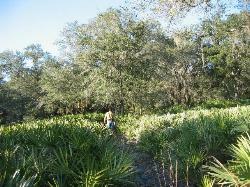 We see a great deal of sabal palm and palmetto. Unfortunately, our hike is hurried, as we worry that the early sunset this time of year (about 5:15 pm) will shroud us in darkness in the middle of this mysterious, unknown swamp, and we'd be forced to make provisions to camp overnight with those dreaded alligators and snakes, oh my!!! Happily, though, we arrive back at the trailhead with plenty of daylight time left, and we head back to the Land of the Mouse to enjoy a delightful dinner at a sushi restaurant in downtown Celebration (where, oddly, shaving cream has been sprayed onto the main street to simulate snow during this holiday season).